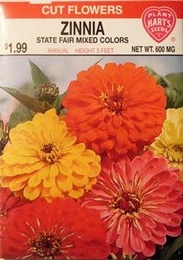 The Zinnia is one of the most popular flowers today. The State Fair Mixture with its bold striking masses of bright color is unexcelled for cutting. The tall plants also make ideal tall beds or background planting. Blossoms are about 5 1/2 inches across and are borne on long stems. Zinnias thrive during hot weather in well fertilized soil, with moderate water. One of the easiest kind to grow from a seed, a single row will provide plenty of blooms for cutting. May be sown up until the end of July. Thinning - when plants are 2-4 inches tall thin to 30 inches apart.